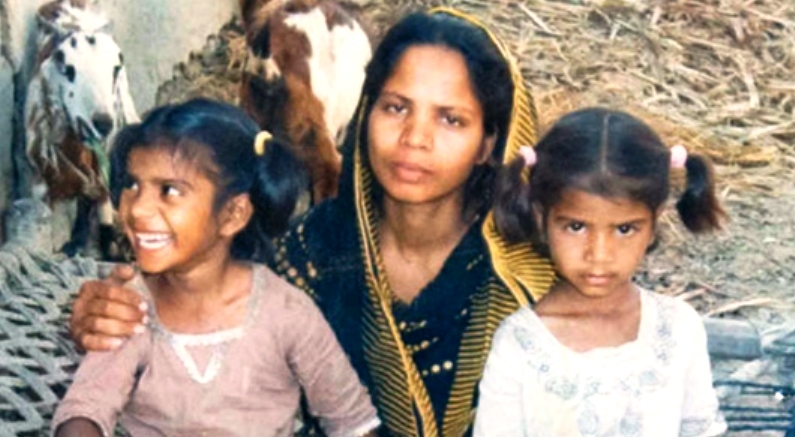 Asia Bibi with two of her five children, prior to her death row imprisonment for “blasphemy” in 2010. On October 9, Pakistan’s Supreme Court heard the final appeal of a Christian woman who has been on death row for nearly a decade on the accusation that she insulted Islam’s prophet Muhammad. The woman’s fate is now sealed: “They [judges] have come to a decision, but it has been reserved,” reported Mehwish Bhatti, an officer with the British-Pakistani Christian Association, from the courthouse. Aasiya Noreen—better known as “Asia Bibi”—is a 47-year-old married mother of five children who fell afoul of Pakistan’s notorious blasphemy law nearly a decade ago. According to her autobiography, Blasphemy: A Memoir: Sentenced to Death Over a Cup of Water, on June 14, 2009, she went to work picking berries in a field. Although she was accustomed to being ostracized by the other female pickers on account of her Christian faith, things came to a head when the dehydrated woman drank water from a common well on that sweltering summer day. The argument spiraled, and the women began calling on Bibi to convert to Islam in order to save herself. “What did your Prophet Mohammed ever do to save mankind?” the embattled woman shot back. After this, Bibi said the women started screaming, spitting at her and physically assaulting her. She ran home in a fright. Less than a week later, she went fruit-picking in another field when she was confronted by a rioting crowd, led by the woman who had initially shouted at her. Bibi was taken to the village police station, covered in blood, where police interrogated her and put a report together. She was then put into a police van and taken straight to prison. She has been in that cell ever since. All of this for asking a rhetorical question—“What did your Prophet Mohammed ever do to save mankind?”—variants of which non-Muslims have been asking for centuries. In the late 1390s, for instance, Roman Emperor Manuel II Palaiologos responded to a group of Muslim scholars bent on converting him to Islam by saying, “Show me just what Mohammed brought that was new, and there you will find things only evil and inhuman, such as his command to spread by the sword the faith he preached.” Over 600 years later, in 2006, when Pope Benedict passingly quoted this assertion, anti-Christian riots erupted around the Muslim world, churches were burned, and an Italian nun who had devoted her life to serving the sick and needy of Somalia was murdered there. Because non-Muslims—particularly Christians, who by definition are known to reject Muhammad’s prophecy—are more likely to be suspected of blasphemy, and because the word of a Christian is not valid against the word of a Muslim, blasphemy accusations by Muslims against Christians are common and routinely result in the imprisoning, beating and even killing of Christians (as when 1,200 Muslims deliberately burned a young Christian couple to death in 2014 for allegedly insulting Islam). Authorities sympathetic to or siding with such “blasphemers” are also targeted. For example, two of her prominent advocates, Governor Salmaan Taseer and Minority Affairs Minister Shabaz Bhatti, were both assassinated in 2011. Taseer was shot twenty-seven times by Mumtaz Qadri, his own bodyguard. After the murder, more than 500 Muslim clerics voiced support for Qadri, who was further showered with rose petals. This is arguably why Pakistani authorities continue to delay issuing a final verdict—to give Bibi time to die “naturally” in jail (as not a few Christians have under “mysterious” circumstances). Instead of placating the world but angering Islamists by releasing her, or placating Islamists but horrifying the world by executing her, the Pakistani judicial system abandoned Bibi to a deathtrap of a jail cell for a decade, where wretched conditions, severe maltreatment, unattended illnesses, psychological abuse and beatings should have killed her, as they did many others before her. In her memoirs, Bibi “wonder[s] whether being a Christian in Pakistan today is not just a failing, or a mark against you, but actually a crime.” Her question is finally about to be answered by Pakistan’s supreme court.